MIRI: Long-time Miri Division Bodybuilding Association (PBBBM) member Cheyenne Morris is now its president for the 2018-2019 term. 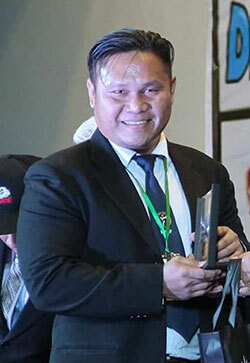 The former athlete, who has been with PBBBM since 2005 as its committee member (multimedia), had risen to his last position as vice-president. He takes over from Jamilah Ibrahim who was appointed president in 2014. The announcement was made during the association’s biennial general meeting at the conference room of the indoor stadium here last Sunday. In his acceptance remarks, Cheyenne said he was humbled by the appointment and vowed to do his best for the association. “I want to thank all of you who are entrusting this huge responsibility upon me. I pledge to give my best for PBBBM, as well as in working together with the parent body SBBA (Sarawak Bodybuilding Association) and fellow affiliate, SDBWA (Sibu Division Bodybuilding and Weightlifting Association),” he said. Meanwhile in her parting remarks, Jamilah said it had been a fulfilling tenure for her in PBBBM, knowing that she had done her best to bring Miri bodybuilding to greater heights. “For the new PBBBM committee, my door is always open whenever you need advice and guidance. For now, I still have responsibility under the Malaysian Bodybuilding Federation (MBBF),” said Jamilah, who is still a vice-president in MBBF. Cheyenne, 42, is the executive artist of Imperial Hotel Miri. He joined bodybuilding in 1999 and entered his first competition in 2005. His first win was the ‘Novice’ title at Mr Miri 2007. He was also the Light Middleweight champion of Mr Miri for three consecutive years from 2009 to 2011. Cheyenne is married to Grace Baya and they have three children – Arnold Lian, Alyssa Joy and Allan Gerawat aged 15, 12 and eight respectively.